I have to say that these books arrived on our doorstep just in time. We had gone out of town last weekend and came home to a frightening medical emergency involving Bookworm1. Daddy was hightailing it to the doctor with the oldest while I stayed home with the youngest, unpacking suitcases and opening the mail. I was delighted to open up a package and discover these books which I promptly sat down and looked through with Bookworms 2 and 3. If you are unfamiliar with Animotion books then you are in for a delightful treat. These aren't your run of the mill picture books. On each page, there is an animation (or animotion) which brings the picture to life. Tilt the book ever-so-slightly up and down or side to side while reading and bunnies truly do hop and chicks hatch out of their eggs. Hop, Pop, and Play is one of Accord Publishing's mini animotion books. Their mini books are about 6 1/2" x 6 1/2", which makes them easy for little hands to hold on to. 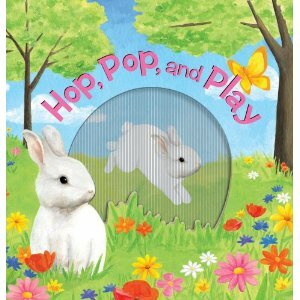 Hop, Pop, and Play is a Spring-ish title displaying lots of animals playing outdoors in a fresh, green world. 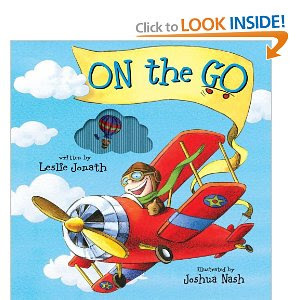 Each page has but one simple sentence on it so they are most suitable for your beginning readers (or those who are familiarizing themselves with the concept of books.) We read, "Piglets play in the mud." On the opposing page we see a piglet shaking itself in a mud puddle. Ducklings splash and lambs jump. These are fun books to look at. On the Go is another book in their mini animotion series which, as you've likely deduced, focuses on transportation. In this particular book we witness submarines diving in the water, snowboarders "whoosh" down the hill and race cars speeding around a track. This one held great appeal to Bookworm2 (age 2 3/4) although due to the fact that there is only one sentence per page, he didn't exhibit as much interest in sitting and reading it so much as much looking at the pictures move. When Bookworm1 (age 5) arrived home from the doctor, he glanced through the book but beyond browsing the books once, they didn't hold that much appeal. These books are not earmarked for a particular age group and I don't necessarily think that they should be. After all, even I'm curious to look at the pictures and see how they move! That said, I do think that they are a great deal more appropriately suited for ages 12 months to 2 years. They would hold the most value to the youngest readers among us, I think. These books were a wonderful distraction to us in our Moment of Need and they've been carted around the house for the past week with the younger two spending the most time looking at the pictures. Thanks, Accord Publishing, for sending these our way for us to check out! Those look cute, and totally remind me of some fairy tale animotion books I had as a little girl. I wonder if my mom still has them--they were magical to me! I hope everything is okay with Bookworm1!! We found one of these(sports edition) at goodwill, and Grasshopper loves it! I need to add these to our shelf. My kids would have loved these books when they were little! I'll remember them for other little ones.. Sounds like a book my littlest guy (3 yr) would enjoy and that my oldest two (6 & 8) would enjoy reading to him. Glad Bookworm 1 is feeling better!! those look really fun :-) i would have liked them as a kid. So sorry about Bookworm 1's emergency! Glad he's home and I hope he's on the mend.